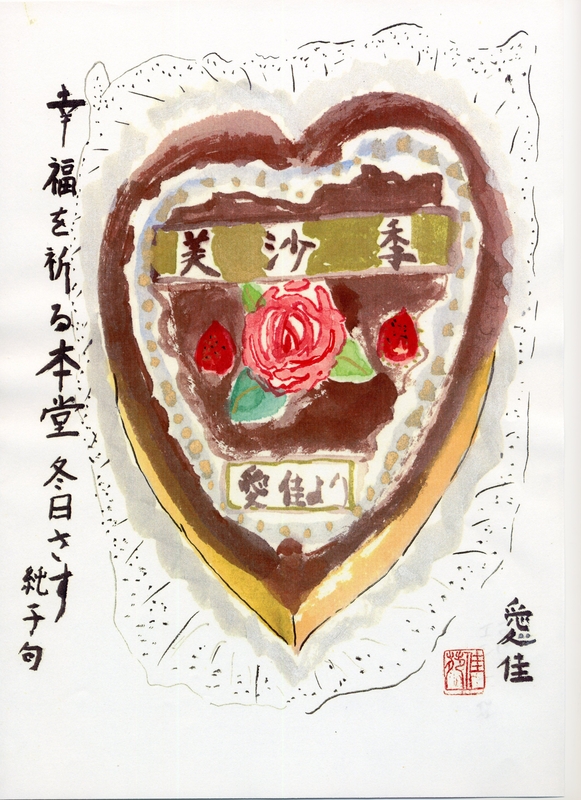 桝田愛佳（Masuda Aika）began painting haiga in her elementary school days. 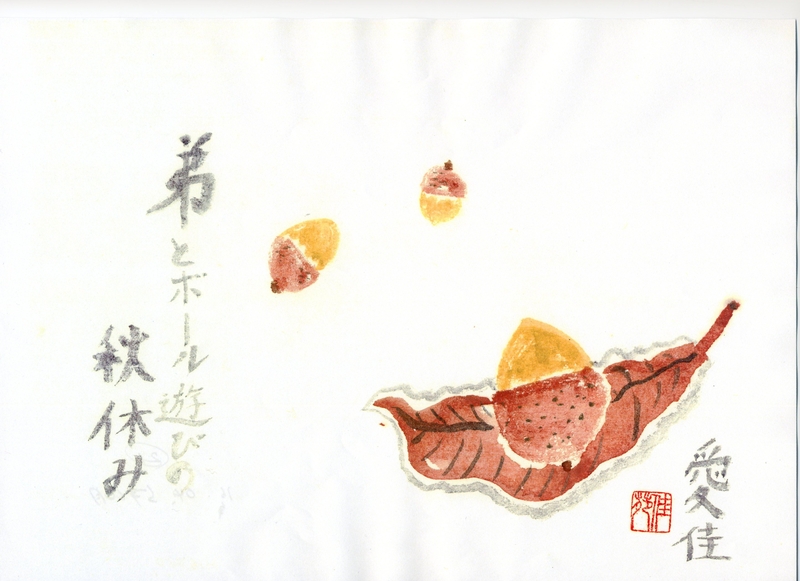 In summer, 2008, her mother, 桝田純子(Masuda Junko), and David Ferron, an ALT (Assistant Language Teacher) in Akita City, Akita, Japan, took up haiga by Masuda Aika as their haiga project. 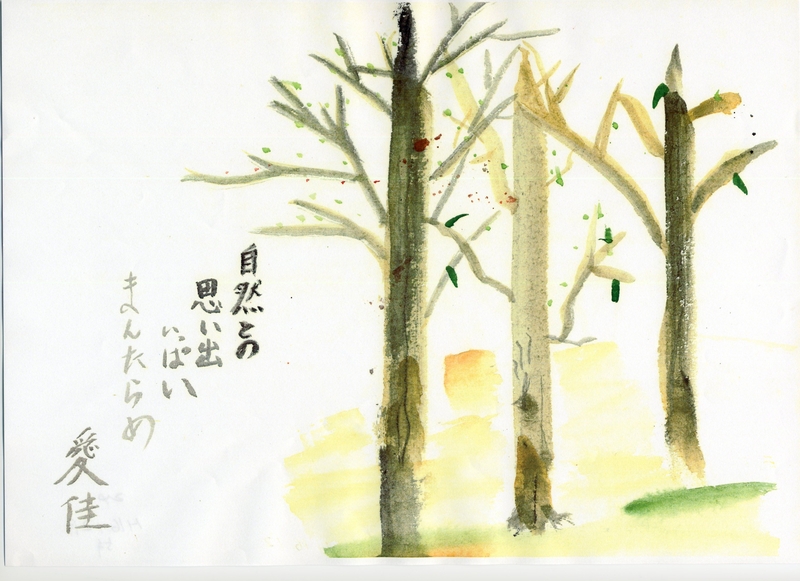 We post their haiga project on the website, dividing it into three stages. This is the last stage of the haiga project. 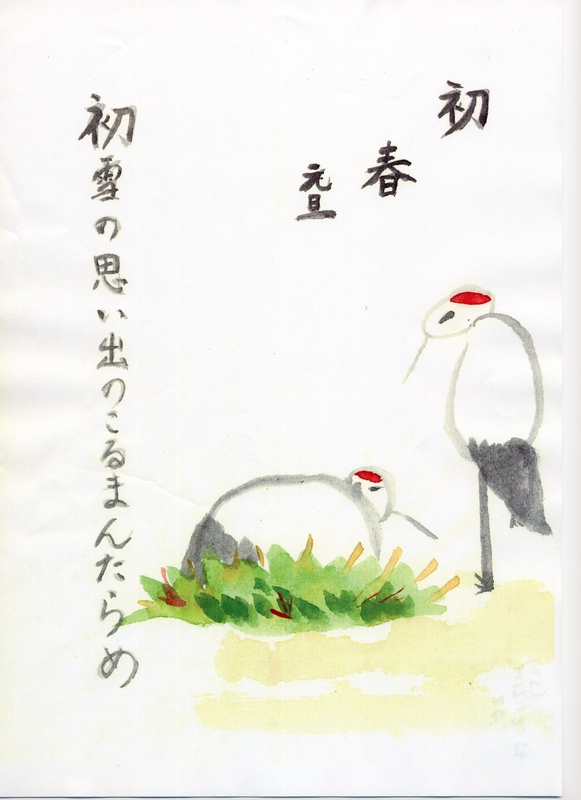 We hope that you will appreciate the last part of haiga, with the three basic haiga in the first part. He said, “I saw my older sister doing it, so I want to try.” He started from July of this year. 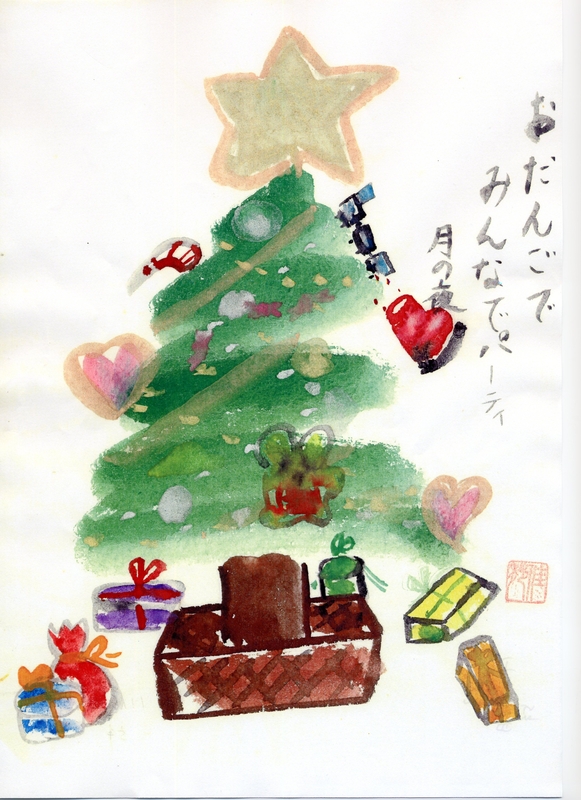 かっぱはそのときの作品です。 A kappa is his piece of artwork from that time. 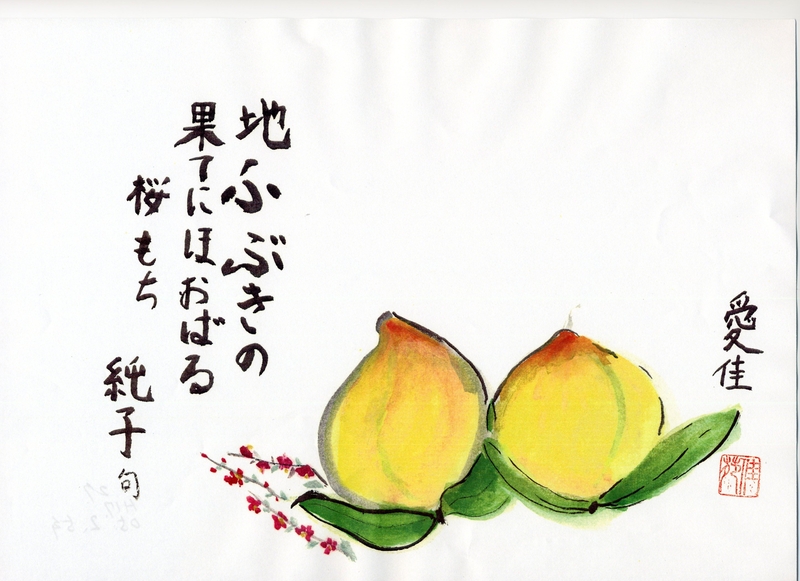 I really, really enjoyed making haiga and before I knew it, two years passed. What changed is that I am now able to speak a little bit more elegantly. 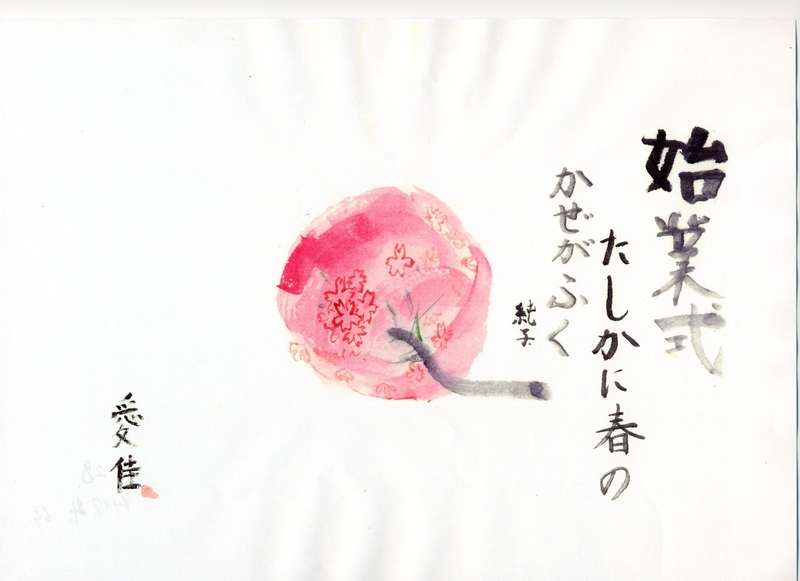 From here on, I want to continue making haiga. I would be happy to remain unacknowledged, however Ms. Masuda asked me to contribute a brief profile of myself with a piece addressing my feelings towards my contribution to the work. So here I go. I am an American and originally hail from Kansas. Yes, Kansas. If you don’t know where that is, I suggest you watch “The Wizard of Oz” or try and buy something made of wheat from America. I currently work for the Japanese government as an ALT (Assistant Language Teacher) in Akita City, Akita, Japan. That basically means I get paid to get kanchos from small children, among other things (I think maybe only two people got that last joke, but I swear those two people laughed really hard). It is in this hectic, yet occasionally enjoyable school setting that I met Ms. Masuda. 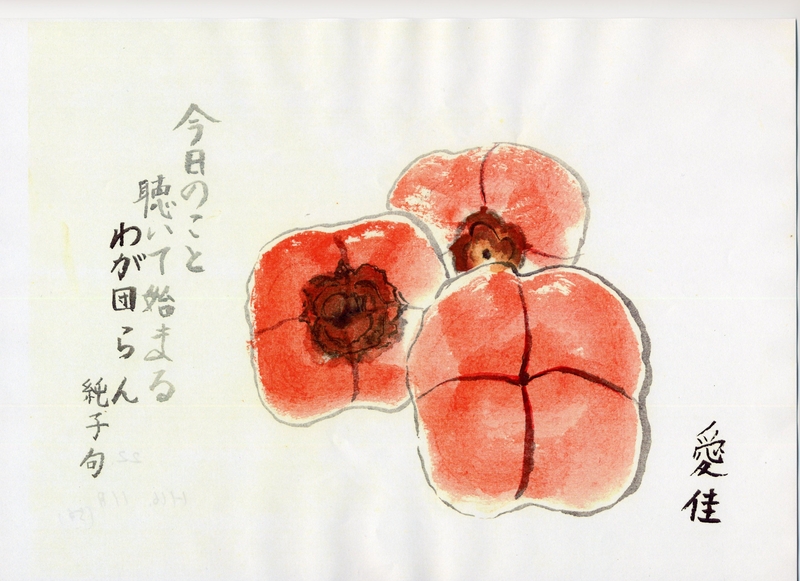 She mentioned her interest in haiga and I admitted my ignorance of the art form. After showing me her daughter’s and son’s artwork, we got on the topic of haiga in English and she wondered how they would sound in another language. From here, the details get sketchy: either she asked me to try my hand at translating them, or I offered myself. I honestly can’t remember exactly how the transaction went down, but next thing I knew, here I was in front of my computer looking at a blue and yellow frog (her son’s painting [which actually has a funny story itself, but I’ll let Ms. Masuda tell that herself, because she tells it with the passion only a mother can have]). As for the translating itself, it actually turned out to be much more of a challenge than what I first thought. Coming into it with some knowledge of Japanese (it was my major in college) and having translated for fun during my free time certainly did help, but by far the hardest part for me was trying to convey the author’s Japanese feelings in English words. 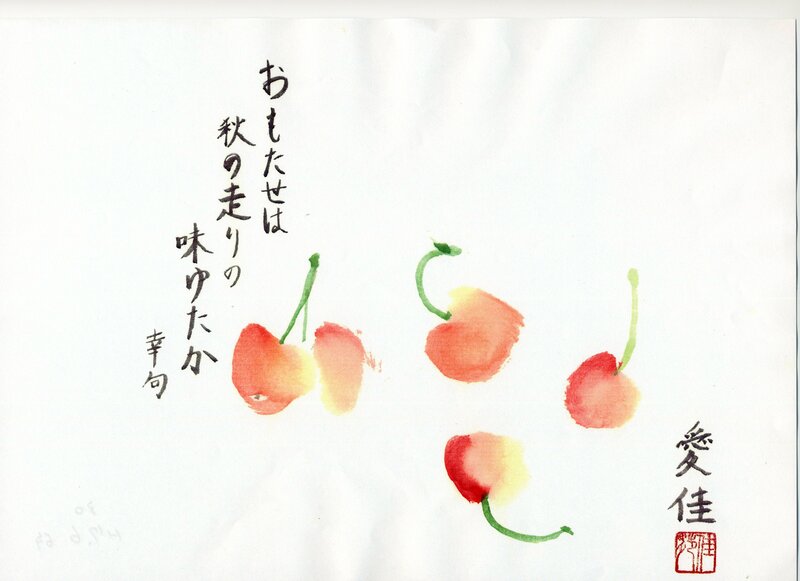 When choosing what words I should use, I tried to keep in mind that the original author started writing haiga when she was nine and made the power point presentation (what I translated from) when she was twelve. So, I tried my best to use words that I thought a girl of similar age, speaking English would use. But at the same time this is a girl writing poetry, so that said, I tried to find a balance between the poetic and the everyday. A related problem of equal importance was word order. As I was in the process of translating, I felt a lot of the haiga may sound more natural, and maybe even more “poetic” to a native speaker, if their word order was switched. But then I questioned: would this jeopardize the original meaning? Should I sacrifice the structure for the meaning? Was it my place to make this judgment call? Ultimately, I decided yes, it was. So from the start, I had to choose which I valued more the structure of the haiga or its meaning, and in the end, I tried my best to find a happy balance. Overall, I tried my best to keep the Japanese word order, but when I felt it sounded significantly better in a different order, I changed it for that particular instance and continued on. Since the original Japanese lacks any punctuation whatsoever, I also tried to keep punctuation to a minimum and inserted it in only when I felt it was necessary. However, I did take some liberties with particles and used them to help smooth the beat for the reader. While the original Japanese versions are often times missing particles, I felt that when turned into English they sounded disjointed and incomplete without them. Thank-you very much for sharing this Haiga with me. I am trying to understand this beautiful art form. These images and writing are inspiring and that an elementary student is studying this is wonderful.